The Summer Games are about to start, and chances are, you're not in Beijing to see them. That's alright, though – we've got the next best thing. Our colleagues over at the Lat Long blog have put together a terrific compendium of everything we're doing to get you as close to the Games as possible. 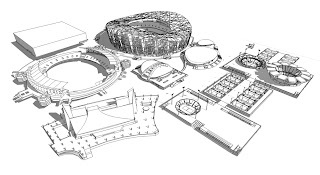 This includes an extensive 3D Warehouse collection of Olympic venues modeled in SketchUp. You can even take a look at them in context with this Google Earth KML. Who needs air travel? That looks neat. I guess I'll see if I can at least get sketchup /viewer/ working on ubuntu..
Gaahh, that's not working either..